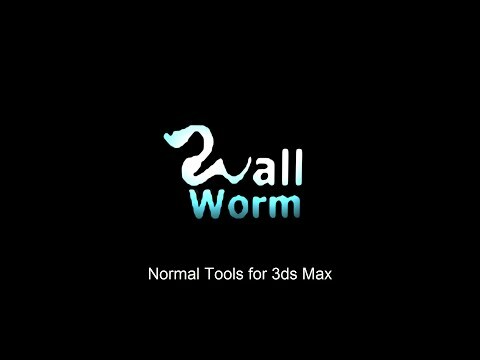 Just released a new little commercial tool set called Normal Tools for manipulating your normal in 3ds Max. Type-in Normal vectors, use a tape helper's direction for normal vector, or use target to point the normal at. Some extra selection tools too, like selecting border normals. Here is an overview video. Nice! This looks really interesting. I was curious if a feature is possible. I would like to paste the normals from one boarder loop to another. In your example where you averaged the boarder normals, I want the top loop to line up exactly with the bottom loop if that makes sense. Currently I do this manually which is really time consuming. Yes, that and some other selection features are on my current todo list for the next update. 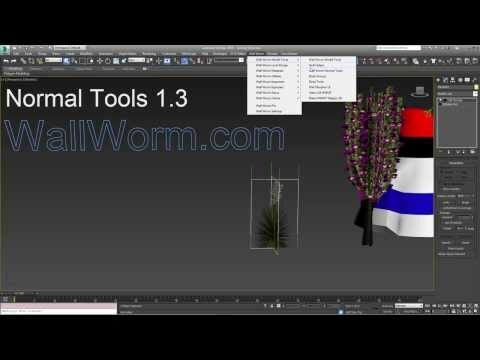 A new update to Normal Tools includes some new selection functions, per element alignment tools and macros for the Border and Element selection functions. See the updated docs with detailed info as well as new graphics to help explain some of the functions. 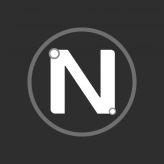 * Added five new functions for aligning normals based on elements: Element Pivot Out, Element Base Out and Element Bottom Out, Element Vert Nearest Pivot Out and Element Vert Nearest Center Out. * Added new button to select all normals in same elements as currently selected normals. * Added three new Macroscripts: Select Element Normals, Select Border Normals and Select Border Normals from Selection. * Changed Normal Tools floater to require the new Macroscripts to be installed. Great tool ! The normal edition in max is such a pain, this is great ! Huh, missed out on this earlier. 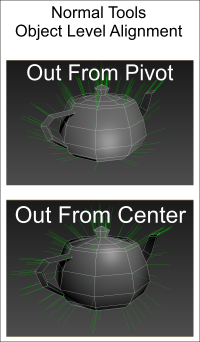 I assume it can do this -> http://www.scriptspot.com/3ds-max/scripts/vertex-normals-stitcher painlessly as well? No I didn't build a stitcher into it but it's something I can add. For those who picked it up in the last couple days, there was a bug in the normal randomization function that was fixed this afternoon. Eric asked me to load some images for Normal Tools. Here are some of the graphics that explain some of the tools. Clicking the image should load a larger version. Selection Functions: you can select all Border Normals. 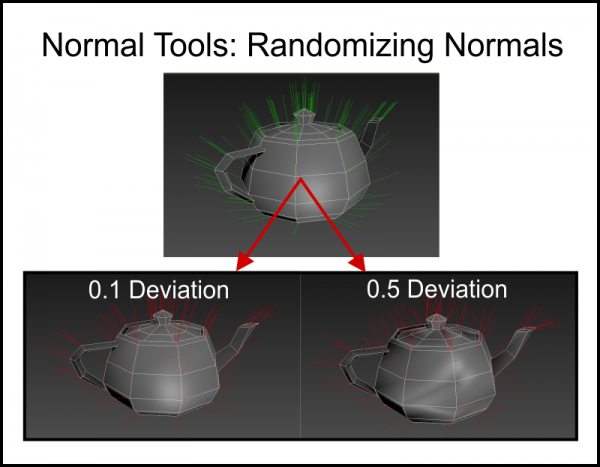 You can also force a sub-selection of currently selected normals to filter out non-border normals. There is also an Element selections, which will select all normal belonging to the same Element(s) as the currently selected vertices. The following graphic demonstrates a single selected vertex converted to all normal belonging to the first selected vertex element; the selected element converted to border normal in that element. The final image is selecting all border normal. The selection functions have macroscripts to bind to keyboard shortcuts. Object Level Automatic Functions: these functions will set the normal defined by a vector from either the object pivot or object center out to each vertex. 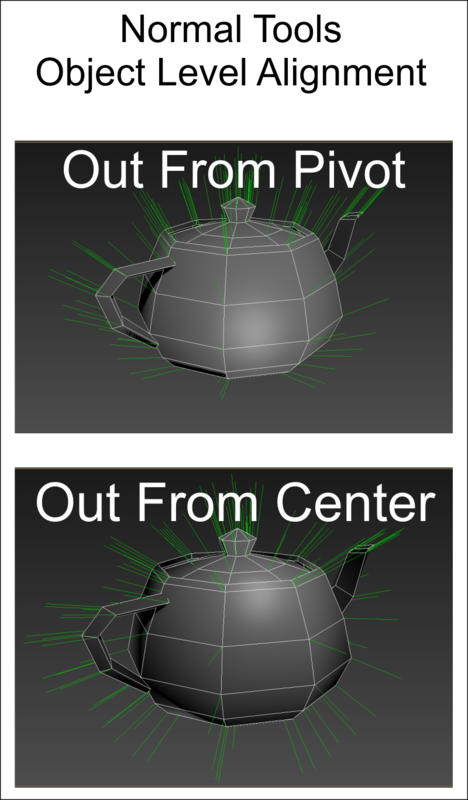 Element Level Automatic Functions: these functions will set the normal defined by a vector from either the Element Center, Base, Bottom or vertex closest to Object Pivot/Center out to each vertex. Note that in the case of Base, Near Center and Near Pivot, the results are not always as expected because at this time the normal vectors all originate at the vertex that is already closest to that point. 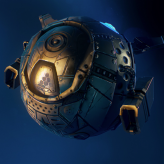 In the future, these three functions will utilize a point derived from the nearest surface of the hull and not a specific vertex. I'll load a video of the new functions soon. 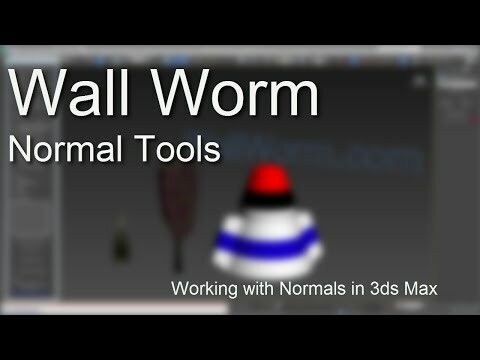 I dont use custom normals everyday, but i guess this could be a ponctual life saver. I shall remember. * Added new setting to automatically apply the Normal Tools custom attribute to any Edit Normals modifier added in the scene. This function can be turned on/off in the Normal Tools floater. * Updated the Normal Tools Custom Attribute to use an AttribID to reduce file size and make it easier to get updated functions in the custom attributes as the Normal Tools are updated. * Updated button functions in the Normal Tools custom attribute to check and see if the Normal Tools are installed before trying to run a function or macroscript. This removed MAXScript errors when sharing files with those who do not have the Normal Tools installed. * Added new Manual group of functions to manually set the normals in the Normal Tools custom attribute. * Added new setting in custom attribute that allows controlling whether the selection functions will replace the current selection, append to current selection or remove from the current selection. * Changed default Apply To setting to All Normals. Just found this one, seems preety cool goona try it out! Added some new features this week including ability to align normals out from the current selection center as well as some other functions. Enjoy.